Last Friday I was in Hamilton for the opening of the 2009 Trust Waikato National Contemporary Art Awards at the Waikato Museum. I was there as this year’s judge of the awards and the winner was announced at the opening on Friday night. The winning entry was a work by Dane Mitchell titled Collateral, pictured above. If you watch TV 1 and 3 and read the newspapers then you probably know by now that it is a work, and decision, that has caused a bit of discussion. Clearly I think that Mitchell’s work was the standout work of all the entrants for 2009. My decision was made after a lot of thought and consideration of all the entries. The fact is that I found that I kept coming back to Collateral, it captured me. The work is a strong, simple idea presented with ease by the artist. Mitchell’s entry was a set of instructions submitted online to the awards as per their standard process. The key aspect of the piece for me was that it was an inspired response to the situation of entering a competition remotely via the internet, plus the additional fact that Mitchell was about to head away to Berlin to undertake a DAAD residency and was unlikely to be around to package and send a work to Hamilton if he was selected as a finalist. 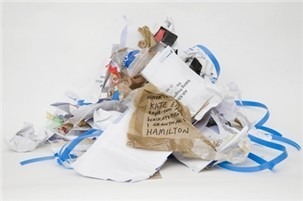 So an idea that was followed, to my mind, by a logical choice of material – the to-be-discarded packaging material from the other finalists’ entries – material that was for all intents and purposes spare, and yes headed for the rubbish. Mitchell created a work that responded to and existed within these parameters, overcoming the difficulties and obstacles of the situation in an intelligent and clever way. Mitchell has a considered approach to material in his practice and in spite of the chance element affecting the make up of this work, it still presents a work that is beautifully material. Some of the works of Mitchell’s in the collection here at Te Papa have a similar aesthetic and approach to both material and detritus. 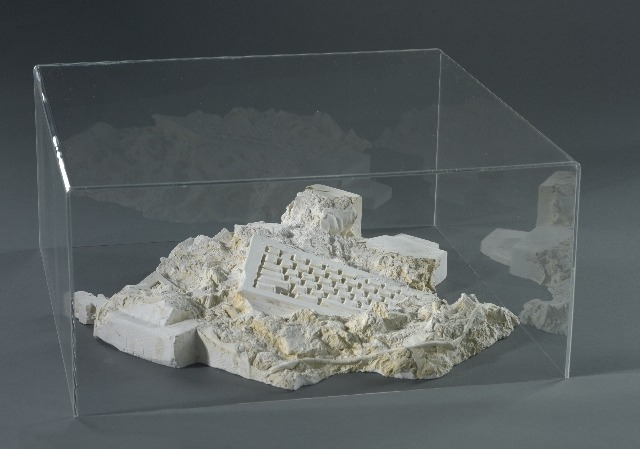 The works Present Surface of Tell are casts from discarded materials such as bubble wrap, old 35mm slide projectors,computer keyboards and various bits and pieces creating fake archaeological finds which raise questions about the selection and authenticity of objects in museums. A pertinent question in relation to Collateral too – with this work Mitchell continues to challenge cultural production by mischief making inside the institution. Don’t we want artists who challenge us? Thanks for your feedback PM. One point that I did not make on TV is that Collateral is not a snide insider joke, but is a challenge to the system – not just the machinations of the artworld, but the whole system including how this kind of gesture is received and discussed publicly. As you point out the media is very much a part of that. Art in the headlines is usually sensationalised, and is so often a superficial discussion about dollar value vs other kinds of value. Thanks Charlotte for fronting up to the discussion and doing that important curatorial thing of providing context to art works! If there is to be a shoot-out between the media and artists up on the high moral ground, then I think that the artists are clearly better armed and are going to be the ones left standing. The media need to point to other people’s loads of rubbish to conceal the fact that current affairs is one of the biggest loads of rubbish around. It’s also a load of rubbish that gets far more money from the public than any artist ever will. Best to hide that fact, they reckon. Artists, however, are more morally able to question the nature of the business they are in. Collateral does that for the reasons that you’ve set out. For me, one of the key points it makes is that institutions quite literally do the picking of winners. A passive appreciation of aesthetics is not the business that the art system is in, despite all media romanticisation to the contrary. If we have to put up with being battered by the “it’s not art” debate every couple of years, then let’s give some time to the “it’s not news” debate as well. It’s hardly new/s that art can takes as its subject matter the art system. It’s hardly new/s that artists give instructions to others on the physical compilation of work. It’s hardly new/s that artists don’t always use high cost materials. I can understand negative feelings about the work. I don’t imagine it felt that great being a fellow contestant and being on the receiving end of an implication that the institution regarded going through their submissions was akin to sifting through rubbish. I am 8years old. I go to Strathmore Primary in Tokoroa. Some of our class were asked to read about the Colossal Squid because our teacher will be asking us some questions. I told my nan and so she pulled up the Te Papa site to have a look. Me and my nan both enjoyed reading about the giant squid and seeing all the pictures. We even made a squid on your site. I hope to visit Wellington so I can come and see the Colossal squid in your museum.